Another intentional community owes its existence to an energetic and ambitious priest who wanted to preserve the character of the neighborhood surrounding his church. Until 1894, Berlin’s English-speaking Catholics shared St. Anne’s Church with French-speakers and services were held in both languages. That year, English-speaking Catholics organized their own parish and began work to establish their own church building. 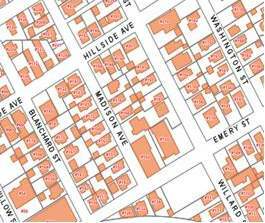 What was to be the site of St. Kieran’s Church (Emery St. at Willard) was purchased by Bishop Denis Bradley, Bishop of the Diocese of Manchester in February 1894 from Henry H. Furbish. (Liber 70, Folio 185). 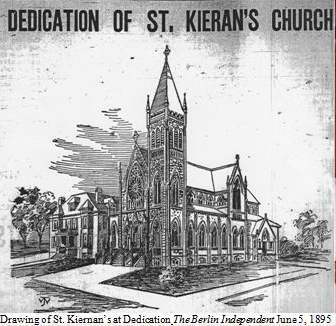 The cornerstone of the church was laid June 3, 1894, and the church was dedicated May 30, 1895 (Berlin Independent June 6, 1894; June 5, 1895). 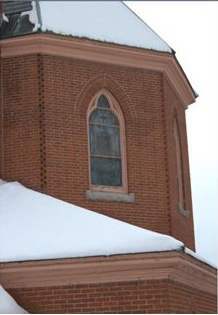 Much of the interior decoration, including the stained glass windows, altars, statuary and rail was donated by parishioners. The interior wood-work including the altars and pews were built by a local Berlin firm, the Berlin Manufacturing Company led by A. N. Gilbert. 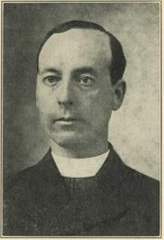 The force behind the new church was an Irishman, Fr. Edward Mackey. Father Mackey also built the parsonage (1894-demolished) and the adjacent St. Patrick’s School (1902/3, corner of Madison & Emery). Fr. Mackey and many of the new residents of the neighborhood were Irish or of Irish heritage. The Irish were generally the seventh largest immigrant group in Berlin (after French-Canadians, English-Canadians, Norwegians, Italians, Russians, English, and some years Polish and Russians). Compared to the number of French Canadians, the Irish were very few in number. 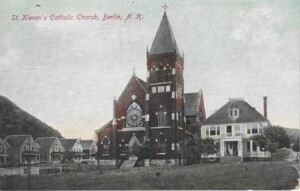 Although some Irish in Berlin emigrated directly from Ireland, Canada was a preferred spot to immigrate to in part because the cost of passage was significantly lower than to the U.S. Second generation Irish, born in Canada to Irish parents were referred to as “Canadian Irishmen.” When they arrived, the Irish settled in the older, denser urban parts of Berlin that had always been home to the newest immigrants. 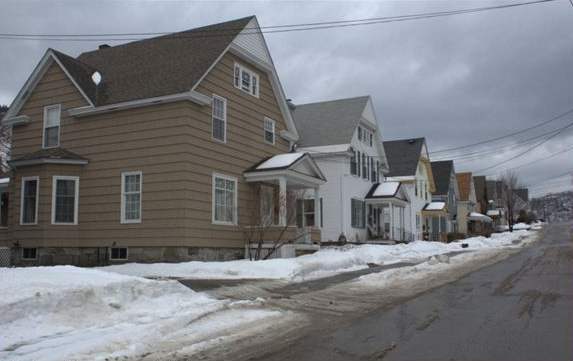 Although Irish families were attracted to the neighborhood, which came to be called “Irish Acres” or “Mackeyville” after the church and houses were built, it was always a much smaller enclave, than, for instance, Norwegian Village. 2In 1910, 63 of 5,082 foreign-born residents of Berlin were from Ireland (both parts) versus 3,025 who were born in French Canada.